Tapper is the first, and only, arcade game not only designed about a bar, but also manufactured to look and feel like part of a Bar. 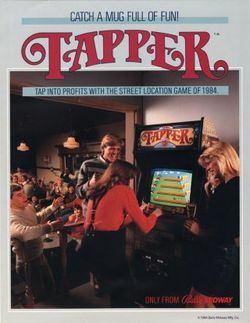 Developed by Marvin Glass and Associates and published by Bally Midway in 1983, Tapper casts the player as an overworked bartender, attempting to serve beer to the ever-thirsty patrons that populate the his bar. What really made Tapper stand out was the brass foot rail and two brass drink holders on each side of the control panel. The cabinet and gameplay on the beer version features the Budweiser logo. The pour spouts have mock-up handles that closely resemble the Budweiser taps that appear in real bars throughout the world. A couple of alternate versions of the game were made, including a Suntory version made for Japan, but the most popular alternative was Root Beer Tapper, which was branded as the more "family friendly" version of the game. Although the game was converted for play on many popular home systems (at least, the ones that remained after the video game market crash of 1983,) ColecoVision was the only home console to officially adopt the Root Beer Tapper version. The remaining home conversions sport a "Mountain Dew" label in place of Budweiser. Root Beer Tapper was released for Xbox Live Arcade on February 7, 2007 for 400 Microsoft Points. Tapper just has two rules: Server every customer, and do not break a single glass. All customers must be served before they work their way up to the beer kegs. If customers are served quickly enough they are "pushed" out of the bar. If not, they down their drink, and send the empty glass down the bar for more. Empty glasses must also be collected before they slide off the end of the bar and smash to the floor. Extra points are awarded for collecting tips, while bonus rounds involve locating the one beer that has not been shaken, and serving it. This page was last edited on 3 February 2010, at 23:06.